Weight training is especially important for older women. Now that I have comfortably landed into midlife, I spend even more time on self-reflection and pondering other long-held assumptions about life, aging, and fitness. When it comes to aging healthily and staying fit, no matter if you're thin or heavy, strength training wins! Ironically, and despite many decades of evidence, many women still simply refuse to seriously engage in weight-bearing exercises. Too many women still erroneously believe that weights are going to bulk them up. Of course nothing could be further from the truth, because maintaining muscle and strength is especially important to women's health as we age. 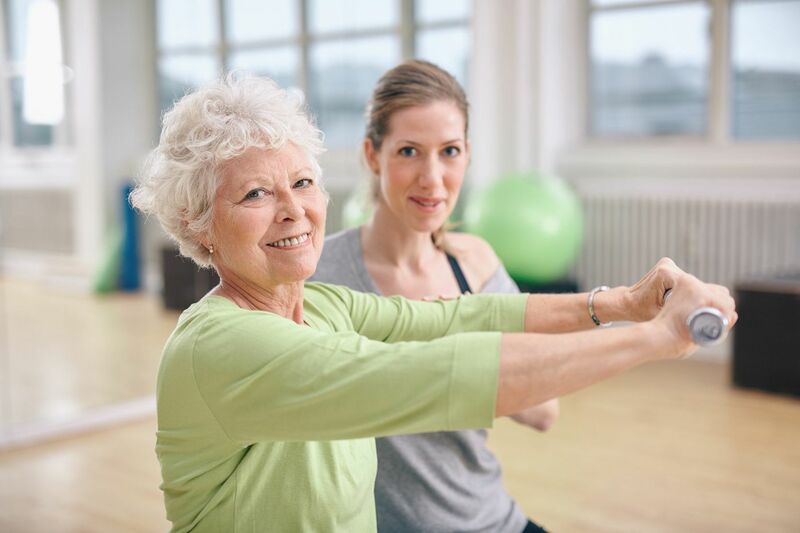 For women, performing weight bearing-exercises, especially in our older years, improves muscle mass, helps maintain strength, preserves our bones, and enriches the overall quality of our daily lives. Yet so many female exercise enthusiasts who I know personally prefer running over any other exercise. Running is likely preferred, I suspect, because of it's ability to produce a quick weight loss. No doubt, running has its merits. It burns calories quickly, is good for your cardiovascular health, and can help in the prevention of diseases like heart disease, diabetes, and obesity. Running was once thought to increase bone density, but most experts now agree that women who run long distances (and long distance can mean as few as 5 miles a day) have a lower bone density than women who just sit around. And women with low bone density are prime candidates for osteoporosis. Fifteen years ago, in a report by the British Journal of Sports Medicine it was stated that, "women who ran the most had the lowest bone density. Each extra 10 kilometers (6.2 miles) run per week was linked to 1% to 2% lower bone density. Women who had more muscle lost less bone, but women with the most muscles were not those who ran the most." Whoa! That's really bad news for female runners overall, and especially bad news for older women who are still running regularly. So, if you're a middle-aged woman still pounding the pavement with your daily runs, this is the time to flip the script and do more weight bearing exercises and cut back on the running. At the gym, the majority of older women I see don't even look at the weights, let alone pick one up, and when they do, they rarely lift weights with any degree of effectiveness. By far, the most popular equipment in the gym among older women remain the treadmill, elliptical, stepper, and the bike. In addition to being unbalanced, doing only cardiovascular exercises will likely exacerbate muscle and bone loss. Unfortunately, cardio only produces the exact opposite of what most older women want and need. While I hate to beat a dead horse (but I will), in older women, muscle mass is the most significant variable influencing bone growth, muscle tone, and staving off bone loss (osteoporosis). The bottom line is, all women, but especially older women need to make weight bearing (strength training) an exercise priority. Fragility is not synonymous with aging. You don't have to become old and frail, and you likely won't, if you continue to push the boundaries and challenge yourself physically with appropriate weight bearing exercises. If you're an older women who's been avoiding strength training exercises, here are four more reasons to pump it up! Weight training strengthens your bones, which reduces your risk of developing osteoporosis (weak and brittle bones). Weight training can decrease your body-fat levels, and a reduction in body fat reduces risks of some cancers. Weight training tones your muscles, which looks great and raises your base metabolic rate (you'll burn more calories while at rest!). Weight training will help you increase your lean tissue (muscle), which will naturally add more shape to your body.